Natural gas grills are in high demand in places where municipal services provide hookups. This includes parks, apartment commons, and community squares where people can grill outside, even if it’s banned on their deck. To accommodate this niche demand Modern Home Products Corp, (MHP) offers their JNR4DD natural gas grill. This unit is designed to fit on a four-inch post, which is included in the purchase. If you already have an existing 4-inch post, it will mount to it easily. If you prefer, you could also use the four bolt holes in the lower base to lag screw it to an outdoor countertop. This grill is specifically designed to burn natural gas through its stainless steel burner element. It isn’t set up to use propane. If you have your heart set on propane, you could attempt to repurpose another burner element. Just keep in mind that this will likely void any product warranty. Natural gas grills inherently need more assembly than a traditional propane grill. You also need to make sure that your municipal hook up is reliable. If you need to mount the pole and anchor it in place, it will certainly extend the assembly time. 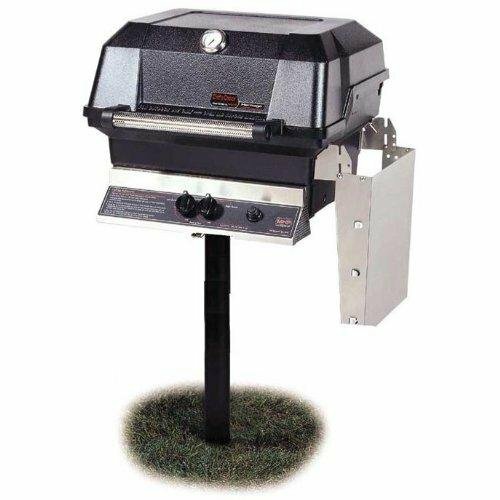 If all you need to do is unbox the grill and install it onto an existing post with a prepared natural gas hook up, you should be able to get this grill up and running in a little over an hour. The MHP Natural Gas grill was designed to be simple yet long-lasting. The stainless steel and other components help resist rust and corrosion issues. If you intend this grill to be part of a pavilion or a community commons area, you might want to also invest in a generic aftermarket cover. This will help prevent weathering problems and extend the overall life of the grill. When left unprotected from the rain, the seal on the face of the thermometer can be prone to let condensation in, making it hard to read at times. The MHP Natural Gas Grill is a little bit on the basic side. It’s not meant to be improvised as a smoker. It can’t be used to create two separate heat zones for hybrid grilling. Yet it can be dialed down low enough to say slowly grill bone-in pieces of chicken. Then quickly heats up to mark and crisp the skin. While there is a small warming rack, it’s not meant to be used as a secondary cooking area. You could, however, grill something like asparagus spears over the primary flame. Then wrap them in heavy duty aluminum foil to stay hot and moist on the warming rack. The primary element is meant for direct heat grilling of things like hot dogs, hamburgers, and the occasional steak. If you want to grill something that has marinade on it, try to pat the bottom with a clean paper towel. This will prevent caramelized marinade from clogging the flame ports of the natural gas burner. One minor flaw to consider is that the corners can be a little inconsistent with the heat. Early on they tend to be a little cool. Yet as the sides of the firebox and lid start to heat up, that heat gets refracted back making the corners a little hotter than the center of the grill grate. 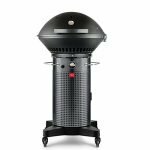 The MHP Natural Gas Grill provides 495 square inches. This is enough to grill up burger patties for four to five diners. Natural gas elements can be a little tougher to clean than propane. There isn’t any form of heat tent to protect things like excess grease and caramelized marinade from dripping onto the flame ports. When this happens, you will need to use a stiff nylon-bristled grill brush to scrap it away. The stainless steel grates can be a little sticky at times. This is even more likely to happen with lean cuts of meat. This also means it will need some extra scraping with the grill brush while the grates are still hot. You can also reduce the chances of food sticking by lightly greasing the grades with an oil-soaked paper towel before you set the food on the hot grate. The rock grates at the bottom can also be a little finicky to clean if they become crusted n burned-on marinade or grease deposits. The MHP Natural Gas Grill has a multi-tier limited warranty. 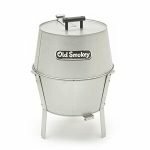 The grill body and lid have a 10-year warranty against rust through. The stainless steel burner has a five-year warranty against rust through. The cooking grates and the stainless steel folding side shelf has a 1-year warranty. All Other Components which includes the Ignitor System Gas Valve, the NuStone Patio Base Knobs, the Rock Grate has a basic 1-Year Warranty. This warranty may be subject to changes for grills that are installed in a commons area if the grill is used abusively. Being able to provide a common source natural gas grill for your home or community living area, is certainly a nice touch. It’s one that guests and tenants are sure to appreciate. Just make sure that the natural gas source is reliable, and that people who use the grill use it responsibly. With that being said, with proper use, the MHP Natural Gas Grill should be able to pay for itself with many long years of use.